Have you met an Earth Angel? Yes, earth angels do exist and they’re all around us. I’ve been lucky enough to meet 2 in my life so far, and I’d like to tell you about them. The 1st is my loving husband, Greg. Our story is quite a fascinating one, so I promise to share it with you another day. The other is my beautiful, wooden Angel that I found in the most mystical way…. I was 27 and my life felt pointless. Alone. Bored. Disappointed. These heavy emotions met me on a daily basis. My life wasn’t where I’d imaged it to be at this age. I was in debt, just surviving pay to pay and drowning in thoughts; yet, I dreamed of so much more. I felt trapped with no way out. It’s difficult to admit, but I was almost to the point of not wanting to live. One day in particular, I knew I had to do something to bring myself out of this heavy cloud; I decided to walk along the beach. The weather matched my emotions – stormy, tumultuous and windy. The ocean was ferocious, waves pounding on the shoreline. I remember this all so clearly. I paced along the beach, tears streaming down my face, trying to release all my sad, angry, frustrating thoughts. Even memories of people I once loved, who no longer walked this earth, tormented me. On the walk back I was pushing against the wind, 1 step forward, 2 steps back. My hair and the sand where whipping my face. It was hard to even stand up straight. Then, out of nowhere, I noticed a small statue-like figure standing in the shallow waters. As I walked over to explore the object, I felt my depression and sadness melting away. Years of frustration,just gone. 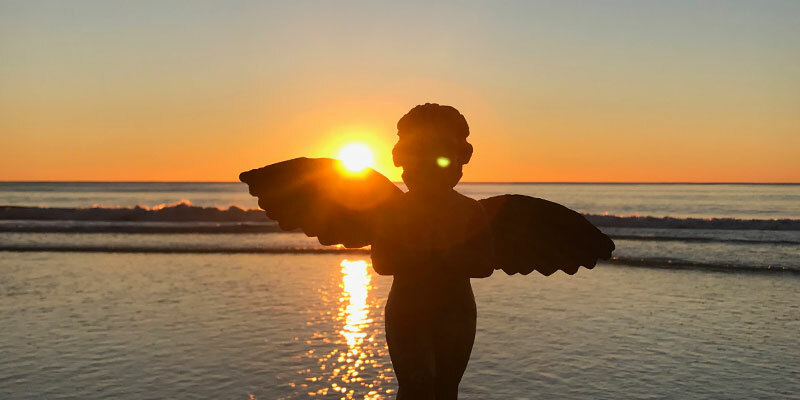 What I found was a magnificently carved, wooden cherub angel standing amongst the blasting wind and crashing waves. It was a miracle in itself that she was standing. Bending down to pick her up, I looked over my shoulder as I was sure someone planted her there. No one was in sight; I was the only crazy person on the beach in such tumultuous weather. I picked up this beautiful angel feeling perplexed how she got here. I marveled at how intricately she was carved. I knew she was a gift and carried her home. To this day I still have this precious angel. My questions of how she got there and how she could have appeared standing up in the stormy ocean still remain unanswered. I am forever grateful for finding her, as I believe she helped save my life. I still find that looking at my majestic earth angel fills me with a sense of peace and calm. It reminds me that miracles do happen, even when you don’t expect them. My faith expands in how magical and powerful this universe truly is, reminding me to believe anything is possible. Thank you, Earth Angel, for helping me to believe again. Your presence in my life has given me the confidence to make changes, and to know that everyone deserves to live a happy, abundant life. I believe that mysteriously finding you has sparked my quest to assist others with Creating A Life You Love. Click here to get inspiration delivered directly to your inbox…..